Holly Hill, FL - December, 2017 – iBeam Vehicle Safety Systems® by Metra Electronics® is introducing a new 360 degree 3D view camera system at 2018 CES. This 3D camera system, the TE-360-3D, is a step up from their latest 360 degree camera system, the TE-360, with its new virtual 3D view feature. This feature allows the driver to see different angles of their vehicle at a bird’s eye view for ultimate visibility. Four cameras mount to each side of the car and are custom calibrated by the installer for image fusion. The innovative control processor blends the feeds into one seamless 360 degree panoramic view. An additional virtual 3D view on the right shows the vehicle from an overhead perspective, allowing the user to pan in their desired direction. 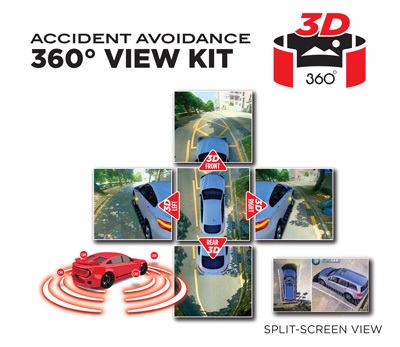 This added 3D feature gives the driver complete coverage, with an aerial view of the vehicle similar to what you’d experience in a video game or virtual reality. Integrated turn and reverse triggers provide instantaneous displays of side or rear camera feeds when changing lanes, parking or reversing. This cutting-edge system provides an unobstructed view of vehicle surroundings, while recording all four channels simultaneously. Drivers can also toggle through multiple camera views for maximum guidance. For security surveillance purposes, the camera system can also record while the vehicle is parked. The TE-360-3D uses tape (included with the system) for fast calibration. The tape is placed on the floor around the vehicle for an easy and more precise calibration method. SD cards (TE-16SD) are sold separately. See this exciting new technology at the Metra Electronics CES booth #5211 in Las Vegas, from January 9 - 12, 2018.